2014 Annual Meeting in the United States Capitol, left to right: (Front row) Cornelia Smithwick, Dianne Robinson, Congressman Joe Wilson, Brantley Knowles, and Vic Brandt; (Second row) Barry Howard, Craig Metz, Charles Lucas and Anne Brandt. 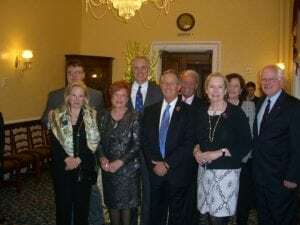 The Annual Meeting of the American Friends of St George’s and Descendants of the Knights of the Garter was held following a reception for members and prospective members on Monday, April 7, 2014, in The Speaker’s Dining Room in the United States Capitol. Officers who were elected for the term of one year, are: Julian Victor Brandt III, President; Anne Read Brandt, Treasurer; and Dianne Alley Robinson, Secretary. Outgoing President Craig Huseman Metz was elected Honorary President. Additionally, Helen Daly was elected an Honorary Member, in recognition of the administrative assistance that she has provided to the American Friends during the past four years. Cornelia Covington Smithwick and Karen Elizabeth McClendon were elected to the Board of Directors, and the following members of the Board of Directors were re-elected: Julian Victor Brandt III; Charles Allen Foster; Barry Christopher Howard; Brantley Carter Bolling Knowles; Craig Huseman Metz; Mrs John Douglas Pigott, Jr; Dianne Alley Robinson; Captain Joseph Spurr IV; William L. Truscott; And Mrs Shelby D. Ward, Jr. Colonel David Steele was elected to replace Colonel David Axson, and the Right Reverend David Conner was re-elected, each as Non-Voting Members of the Board of Directors. President Metz commended Colonel Axson to those in attendance on his six years of dedicated service as the Clerks to the Friends and Companions, which ended in May of 2013. In his report to the members, President Metz reflected upon the accomplishments of the preceding year, which included the donation by the American Friends of the funds to provide for the improvement of the facilities for disabled visitors to St George’s Chapel, with the installation of a major ramp between the Nave and Quire on the north side of the Chapel. This project is to include: a feasibility study, careful historical and architectural investigations, obtaining formal permission from statutory bodies, design execution, and the delivery of the facility in the location that is adjacent to the North Door and the Rutland Chantry. President Metz also outlined the St George’s Chapel Companion, Adopt-a-Boss, and Adopt-a-Book Programs, and he encouraged those in attendance to become supporters. Brochures relating to these Programs were distributed, and copies of the Annual Review were made available at the meeting. President Metz also discussed the Annual Garter Day Ceremony at Windsor Castle, and he recognised the American Friends who attended the ceremony in 2013: John Shannon, Curtis Estes, Stanley Heisler, Captain Clarke Cooper, and Captain Michael Marin. American Friends who attended the Garter Ceremony in June 2014 were: John Cupschalk from New York, Stanley D. Heisler from Connecticut, 2nd Lt Justin Rojek, John Shannon (with guests) from Jersey City, New Jersey, Ellsworth George Stanton III from New York, and Mark and Vicky Wille from California. 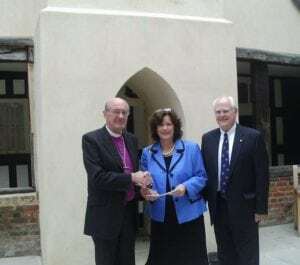 On September 29th, Mr and Mrs Brandt met with Dean Conner and Colonel Steele at Windsor Castle, at which time they presented a check in the amount of $10,000.00, that was received from the Estate of William Robertson Hull, our Past President and First Honorary President, to be used for restoration work at St George’s Chapel. Dean Conner and Colonel Steele graciously accepted the donation, that is to be designated in memory of Honorary President Hull. The 2015 Annual Meeting of the American Friends will be held in conjunction with a tea on Monday, April 13th at the Ritz-Carlton Pentagon city, Arlington, Virginia, from 3.00 pm to 5.00 pm. The Dean receiving the cheque from Mr and Mrs Brandt.